The Baltic states of Latvia, Lithuania and Estonia intend to at least double their spending on new defense equipment in the next two years over the “perceived threat” from Russia. Radio Sputnik discussed the issue with Bryan MacDonald, an Irish journalist, specializing in Eastern Europe and Russia. 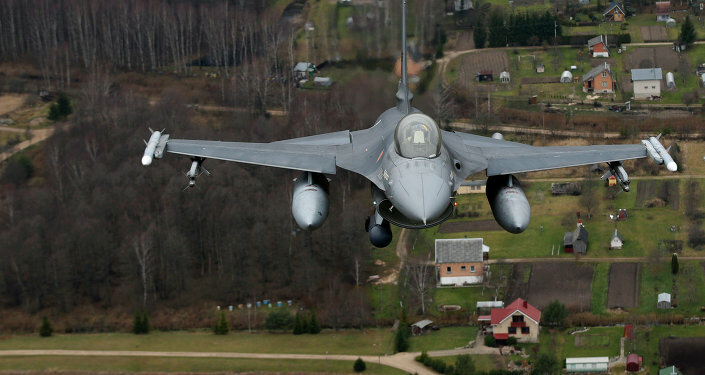 “[Of the three Baltic states] only Estonia has been able to match the NATO target of 2 percent of the GDP to be spent on defense,” Bryan MacDonald noted. When asked about the likelihood of Latvia, Lithuania and Estonia boosting their defense spending due to the imaginary Russian aggression, Bryan MacDonald said that the Baltic states are small countries bordered by a much larger and much more powerful neighbor. “They are susceptible to the bombardment of Western propaganda, particularly from American sources, about the imminent danger from an imminent Russian invasion, which, of course, is utterly ridiculous since the Baltic states are under NATO’s protection and any attack against them would presumably lead to a war with the United States, which has the most powerful military in the world,” he said. Moreover, these countries are under extraordinary pressure by various lobby groups, domestic and foreign, including US arms manufacturers, to increase their arms spending, and who are benefiting from these contracts. Since the beginning of the Ukrainian crisis, the so-called threat of a Russian invasion has been constantly used to justify military expansion in Eastern Europe. Russia has constantly called these claims absurd and ridiculous, but this imaginary Russian threat has been used to boost military spending. “There are dozens, even hundreds of think tanks and various groups that are funded by American arms contractors like Northrop Grumman and Raytheon and also by the Atlantic Council, which is also funded by the US Defense Department. They are looking for markets, just like any business. The Baltic countries are spending over $600 million on defense and all this money will go to these arms makers because these countries have no domestic munitions capability and manufacturing of their own,” he emphasized. When asked if he had a chance to speak to ordinary Eastern Europeans, including in the Baltic countries, would they be aware of all this, that they are the ones who are actually paying for all this military buildup, Bryan MacDonald said that he had recently been to a small town in Latvia and spoke to many people there who said they were alarmed by what was going on. “You know, ordinary people and governments are entirely different things. The leaders of these countries simply refuse to talk to Russia, period,” Bryan MacDonald said. NATO has been reinforcing its military presence in Europe, particularly in the Eastern European states, since the outbreak of the Ukrainian crisis, citing Russia's alleged interference in the conflict as a justification for the move. Moscow has repeatedly denied the accusations, calling NATO's military buildup near Russia’s borders provocative.